Pregnancy is a complicated and oftentimes confusing process. Two simple “half cells” quickly become four and then eight. 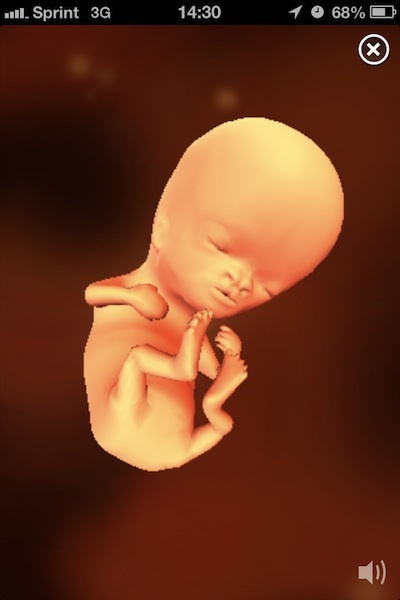 Those cells continue to multiply to form an embryo, which–with continued development–becomes a fetus. 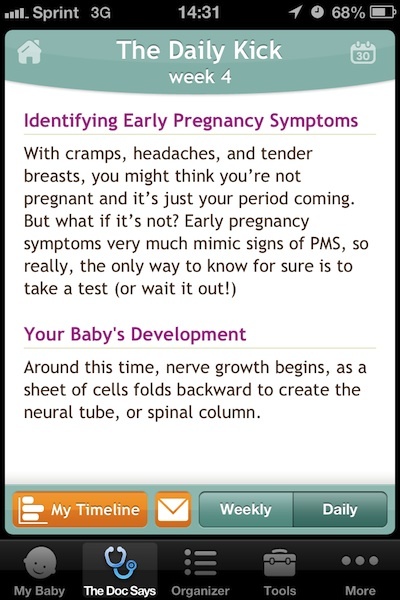 The Pregnancy Sprout medical app provides an illustrated weekly guide to the changes and developments of pregnancy. Upon first using the app, users can input the due date or the first date of the last period. The app uses this information to provide individualized information and guidance. After entering this data or opting to put it in later, the user is brought to the Home screen. 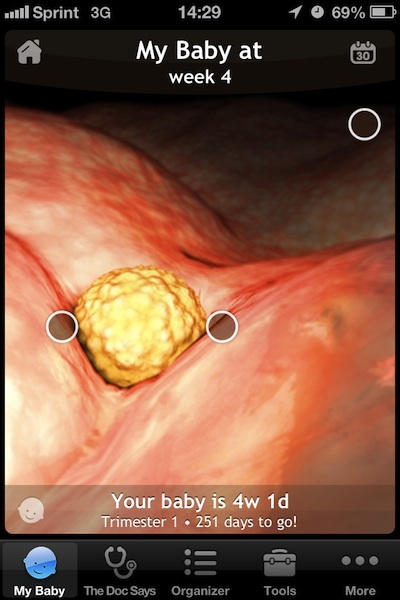 Based on the stage in pregnancy the user is at, the Home screen displays an image of what the embryo/fetus looks like. 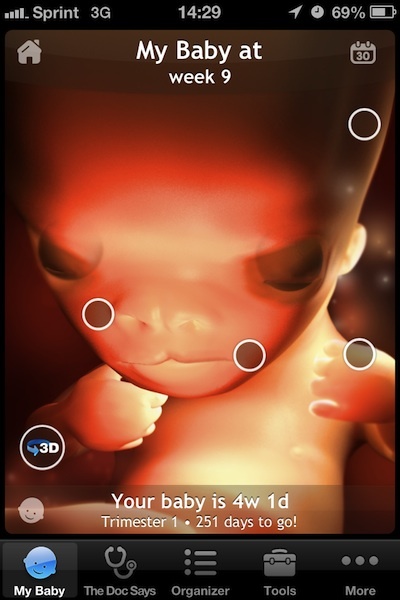 Circles on the image denote bullet points of interest and when applicable, the 3D icon allows you to see the embyro/fetus from multiple viewpoints. The toolbar at the bottom gives you access to the other features of the app, including the image from the Home screen, The Doc Says section, Organizer section, Tools, and More. 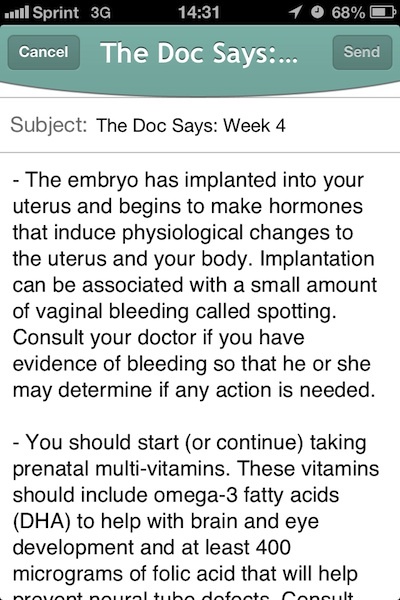 The Doc Says section provides various helpful guidance based on the gestational week. The information discussed appropriately focuses on common questions or concerns of pregnancy. In addition to the written information provided, you can add reminders to your organizer section when the plus icon appears. This information may also be emailed. 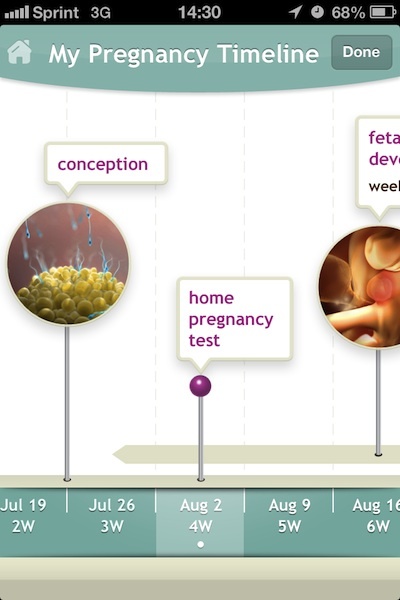 This section also provides access to the My Pregnancy Timeline that provides milestones, upcoming appointments, and upcoming tests and studies. The Organizer section is organized into M.D. 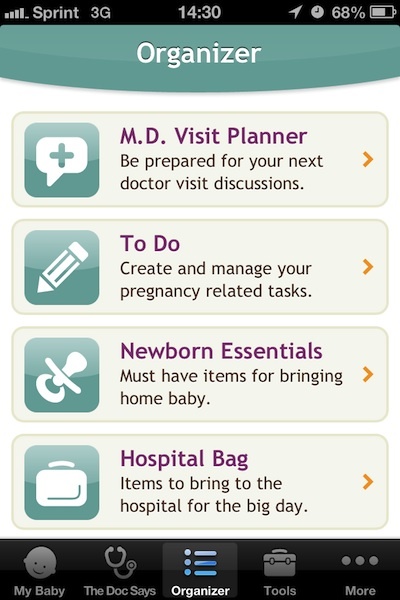 Visit Planner, To Do, Newborn Essentials checklist, and Hospital Bag checklist. For the checklists, the app provides a pre-populated list in order to add additional items. The M.D. Visit Planner saves the reminders you gave yourself from The Doc Says section, allows you to add appointments, and provides a list of reasonable and relevant questions that could be asked at the doctors. 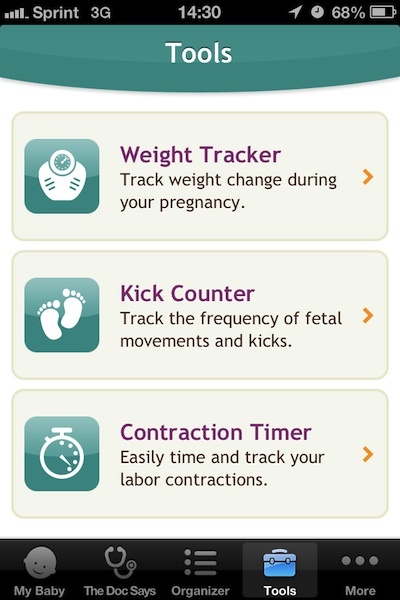 The Tools section includes a Weight Tracker, a Kick Counter, and a Contraction Timer. The final section More has links to other apps, the ability to add Facebook and Twitter accounts, change the pregnancy due date information, among others. 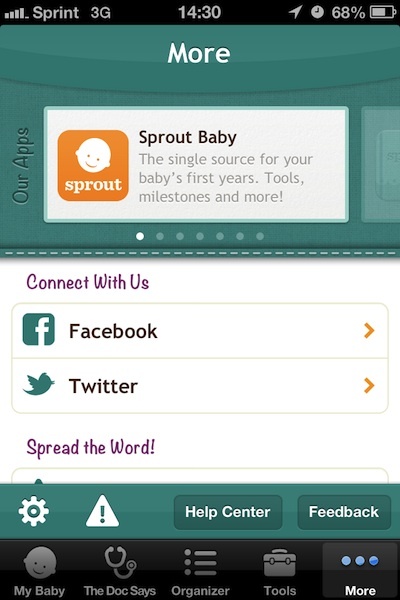 The Pregnancy Sprout medical app provides weekly guidance and information on pregnancy and on fetal growth. 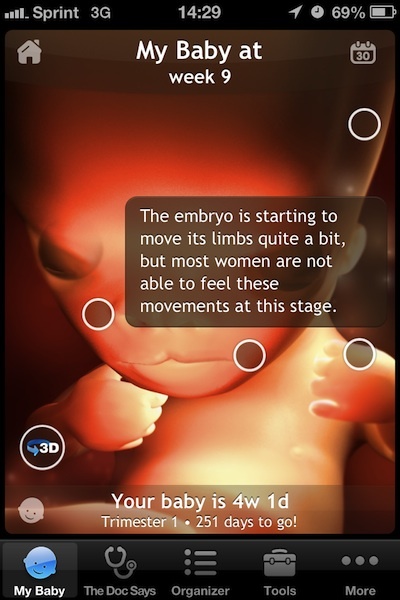 The app provides an array of images, checklists, illustrated timelines, and helpful information that can guide pregnant women, their partners, family, and friends through pregnancy. These features are done in a way that adds to the doctor/patient relationship and helps better inform patients about important things to ask their providers. 1. User Interface – 5. Toolbar allows for easy navigation. 2. Multimedia usage – 4. Includes smooth transitions, 3D images, illustrations. 4. Real world applicability – 4. Could be used daily during a pregnancy. Compatibility: Compatible with iPhone, iPod touch, and iPad. Optimized for iPhone 5. This post does not establish, nor is it intended to establish, a patient physician relationship with anyone. It does not substitute for professional advice, and does not substitute for an in-person evaluation with your healthcare provider. It does not provide the definitive statement on the subject addressed. Before using these apps please consult with your own physician or healthcare provider as to the apps validity and accuracy as this post is not intended to affirm the validity or accuracy of the apps in question. 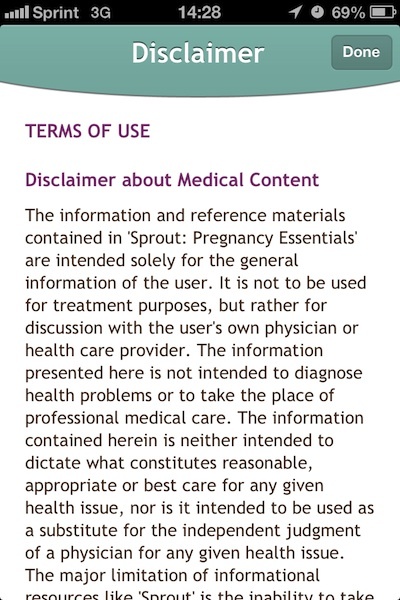 The app(s) mentioned in this post should not be used without discussing the app first with your healthcare provider.